Enjoy an extraordinary Valentine's dinner at the Straight Up Roofdeck Bar of Seda Capitol Central for only P2799 nett per couple. Stunning views of the city, superb cuisine, romantic live music, wine, plus roses and candy will guarantee an enchanting evening for you and your loved one. The day of hearts is coming in a couple of weeks and many are already planning their special date. I suggest that on this special day, experience an extraordinary Valentine’s with your beloved at the Straight Up Roofdeck Bar of Seda Capitol Central. Find out what makes it so indulgent and so worth every dime. 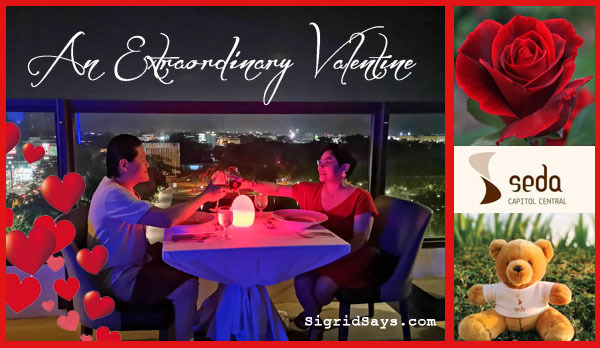 Enjoy an extraordinary Valentine’s dinner at the Straight Up Roofdeck Bar of Seda Capitol Central for only P2799 nett per couple. Stunning views of the city, superb cuisine, romantic live music, wine, plus roses and candy will guarantee an enchanting evening for you and your loved one. Your love and commitment may be constant and you show your your affection everyday, but wouldn’t it be also nice to celebrate it once a year during Valentine’s day? Do it this year. With your better half, head on to the Seda Capitol Central on February 14 for a romantic and delightfully crafted date at the Straight Up Roofdeck Bar. The Straight Up Roofdeck Bar of Seda Capitol Central already looks so cozy and romantic on a regular day. They will dress this up further for Valentine’s Day. Impress your date with this one-of-a-kind experience. With the gorgeous view around you, wine and dine over an 8-course French-inspired dinner that is especially designed to titillate the palate and excite the senses. 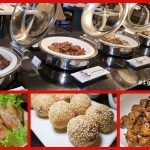 My husband and I had a preview of the full dinner and we totally loved the food and the experience. It was an educational time learning about different French dishes and wine pairings in order to fully enjoy the meal. 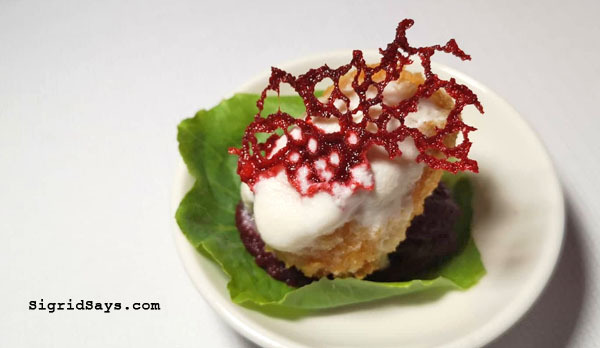 Check out this gorgeous menu of French cuisine specially-designed by Chef Ynan de Rosario. Amuse-bouche: Smoked salmon croquette. Tease your palate with this bite-sized salmon croquette. You have to bite into everything. You preview of the evening’s course. It’s bite-sized. Soup: Chicken consomme with a foie gras and mushroom ravioli. 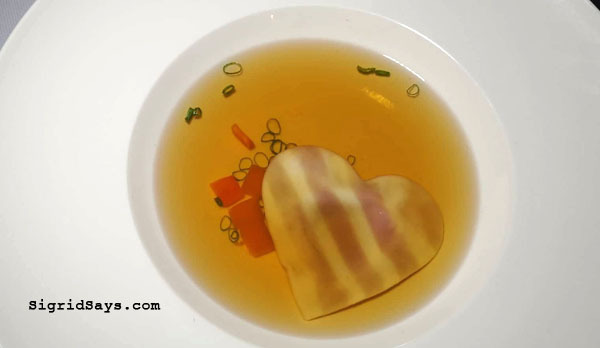 A specially-made heart-shaped ravioli filled with mushroom and foie gras floating over clear soup. The soup. Check out that heart-shaped ravioli filled with foie gras and mushroom. Isn’t it love? 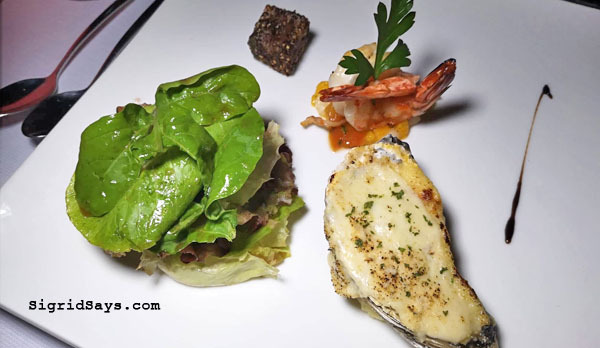 Appetizer: Baked oyster, Pepper-crusted tuna, pan-seared prawns, mixed organic lettuce in raspberry dressing. Start with the baked oyster for a light appetizer, building up to the prawns, and lastly the tuna, which you can eat with the lettuce and dressing to taper down the strong peppery flavor. This appetizer set is so grand! Don’t underestimate that small cube of pepper-crusted tuna. It’s packed with flavor! 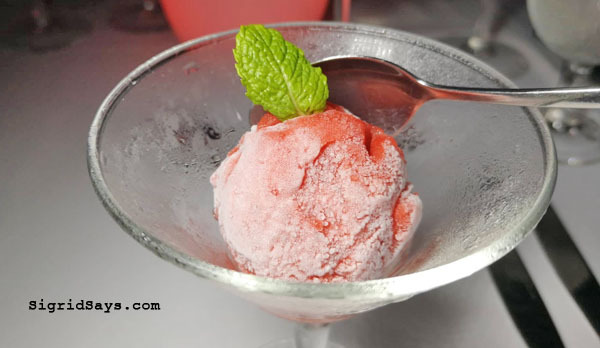 Sorbet: Strawberry lychee. A really good palate cleanser in preparation for the main courses. The sweet and sour fruity blend is so refreshing. 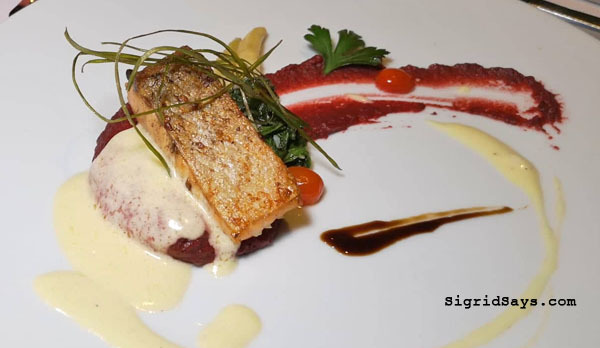 Fish course: Pan-seared salmon on beetroot puree, sauteed spinach, asparagus spears, and cherry tomato. Love love! Beautifully seared salmon that features a crispy skin and juicy meat. It’s a burst of flavor with every bite, including those fried leaves on top. Beef course: Grilled beef tenderloin on truffle mushroom risotto, potato and vegetable casserole with madeira sauce. Beautiful and oh so good! 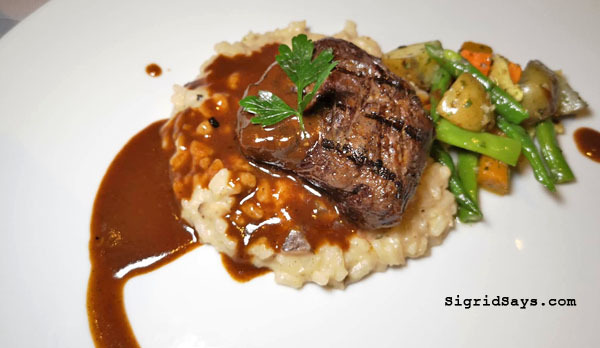 A medium Angus beef steak on risotto with Madeira (wine reduction) sauce. Super! Cheese course: Caramelized goat cheese with mango and arugula with balsamic reduction dressing. This will prepare your palate if you want to keep drinking for the rest of the evening. Take a little of cheese with the mango and arugula with each bite to experience the full flavor. 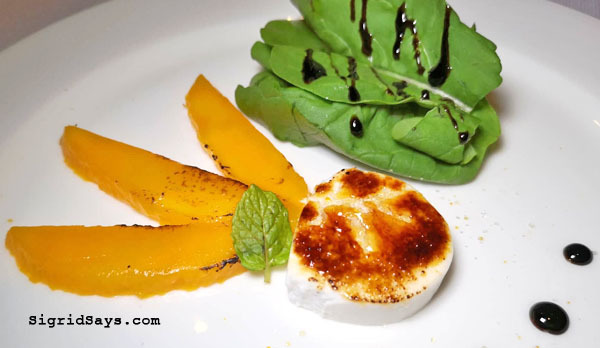 Goat cheese served with mango and arugula. Wonderful combination of sweet, salty, bitter, and a little bit of sourness. Drinks: A round of red or white wine that you can choose to be served anytime during your meal. The staff will assist you on wine selection. This dinner is not only gorgeous but hearty as well. By the time I got to the beef course, my tummy is telling me that I am already full. But of course, I still had to taste the dessert and the cheese course. Everything is so good and balanced, including the side dishes and sauces. Hats off to the chef for a fabulous menu! Moreover, there will be many F&B staff who will wait on tables. As soon as you are done, your plates will be removed to make way for the next dish. You will have to allow for the serving of the following dish because of the preparation required. 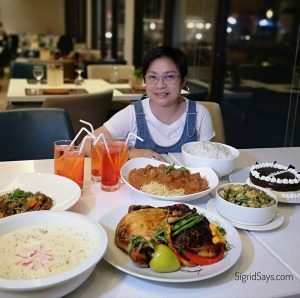 The Table for Two extraordinary Valentine’s dinner at Seda Capitol Central has some sense of exclusivity because they will only accept a maximum of 30 couples (60 pax). This is to ensure that each table is waited on and served very well. So you have to hurry and book a table now. A tip: The best views overlooking the Capitol Lagoon would surely sell out pretty fast. Hurry and make reservations because this side overlooking the Capitol Lagoon will surely fill up fast. If God has already answered your prayer for a future wife and you intend to pop the question, the venue would also be a memorable place to do so. Here are the details of this extraordinary Valentine’s date at the Straight Up Bar of Seda Capitol Central here in Bacolod City. 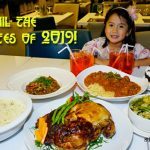 Note: though I highly suggest that if you are a family with kids, have a buffet dinner at the Misto Restaurant on the ground floor instead and let the couples enjoy a quiet and romantic evening without kids running around. Misto also has a special offering for Valentine’s day. 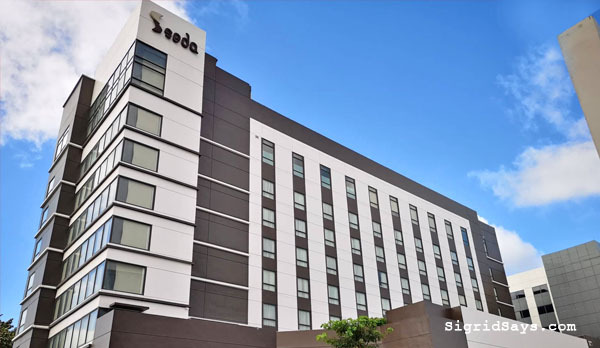 For reservations and inquiries, please call Seda Capitol Central at (034) 703-8888 or email capitol@sedahotels.com. 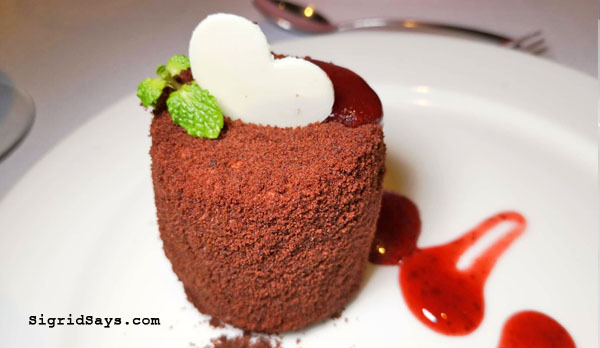 If an extraordinary Valentine’s dinner is not enough, go all out with a staycation at Seda Capitol Central. Treat your sweetheart to a romantic getaway with the special room offers this Valentine Season. Seda Capitol Central towers along Lacson Street, Bacolod City. If you are a family, it would be great to take advantage of this offer. 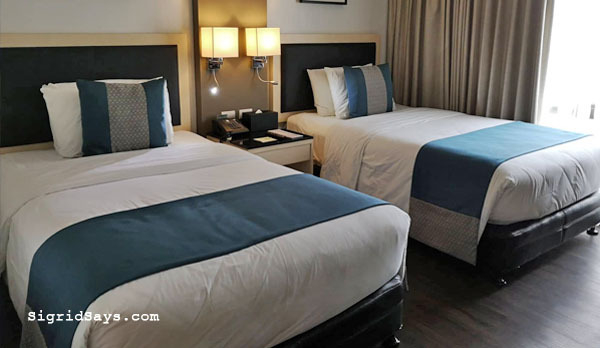 You can check in on February 14 and enjoy the amenities of this Bacolod hotel during the day. We did this and the kids enjoyed swimming in the afternoon. Check the video of our family staycation below. Getting into the water is one of the kids’ favorite things to do. Swimming really makes them happy. Twin beds in the deluxe room. You may also choose the one with the king-sized bed. We opted for this because we have kids. 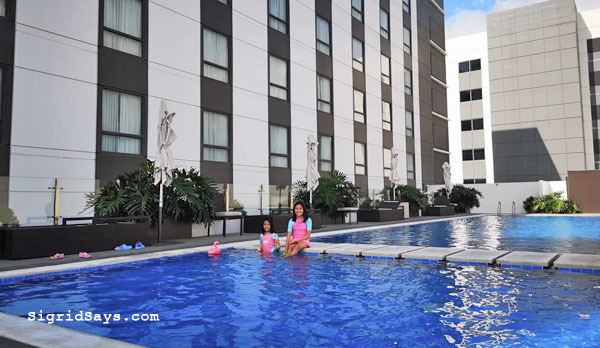 Kids at the pool of Seda Capitol Central. 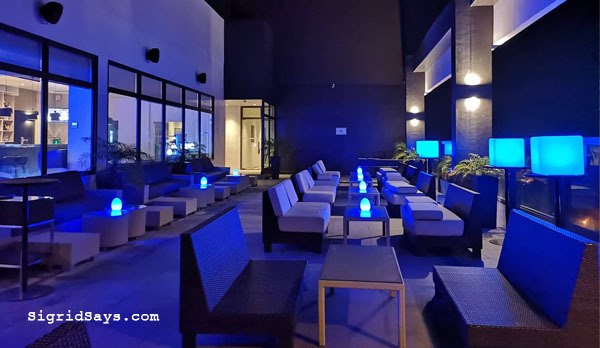 When evening comes, you can leave the kids in the safety and comfort of the deluxe room while you and the wifey can have a romantic dinner at the rooftop. That’s exactly what hubby and I did because we know that the kids are safe. Just remember to instruct them not to open the door to anybody they don’t know. In our case, we brought the key card with us, so that they don’t have to open the door from the inside. Early Check in at 12 noon or late check out at 2pm (subject to availability). 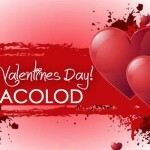 Special Rates will apply if room reservation is confirmed with one of the Valentine’s promotions and service below. 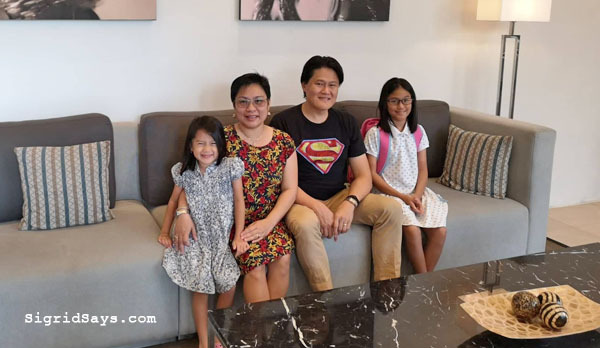 Our family had a staycation at Seda Capitol Central. 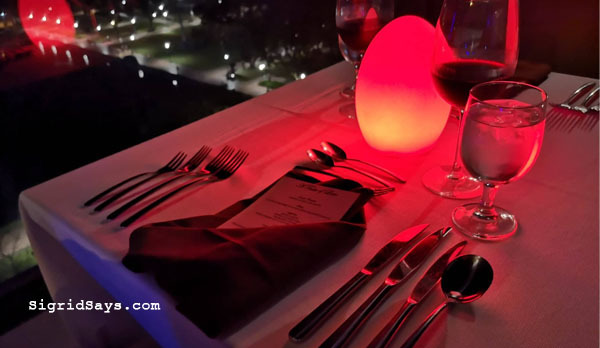 In the evening, hubby and I had that date at Straight Up Roofdeck Bar over the 8-course dinner. 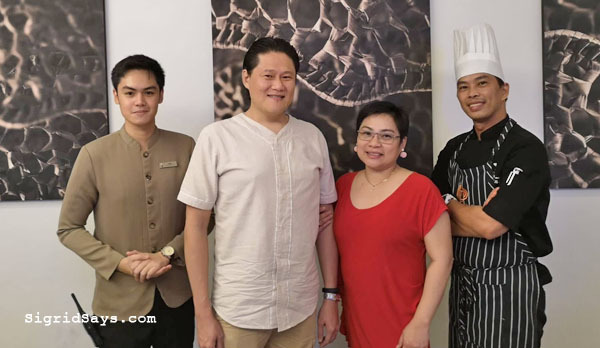 Hubby and I with Chef Ynan del Rosario (right) and Gab of the F&B. 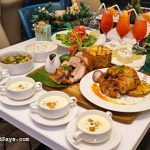 For other options, here’s a list of Bacolod restaurants for you. The food looks amazing…and if it tastes as good as that view looks – I’m in. Price is totally fair too (especially for Valentine’s Day). Seda Capitol Central knows how to perk it up for Vday. This date night looks amazing! Who doesn’t love an 8 course meal! I am hopeful that my husband has a good Valentine’s day surprise date for us this year. This is definitely my kind of date night! I wish we could pull it off. My husband does have something else planned for me. That 8 course meal though sounds amazing! I would love a Valentines staycation at Seda Capitol Central or anywhere with my loves. Also the menu for dinner is really nice! Wow, this is an amazing Valentine date that I would love to have. The food at Straight Up bar of Seda Capitol Central looks so yummy, 8 courses yaass . A staycation is an excellent idea, too. This Valentine’s date looks amazing! As I am allergic to seafood, it makes me sad with all of the seafood courses! However, I suspect they might have other options! Thanks for sharing! I’m not the biggest on Valentine’s Day but this looks like something I could get behind. A little bit of travel, lots of yummy food, and a killer view! Sign me up for this thing at Seda Capitol Central. So worth it for everything that you will get from their package! Would really love that Valentine staycation. It really does look like an amazing experience, and the dishes look spectacular. I would love to try all of them honestly. Yummy! And 8 courses? wow, what a wonderful Valentine date it’s going to be. Everything looks really amazing at Seda Capitol Central. Those dishes looks so yummy and delicious and the scene is so spellbinding! I really want such a nice Valentine’s date night–elegant, sophisticated, and magical. It’s not everyday that you get to do this, so you might as well make it special, right?